Objective: To review a variety of studies utilizing rodent models of endometriosis to illustrate their utility in examining mechanisms associated with development and progression of this disease. 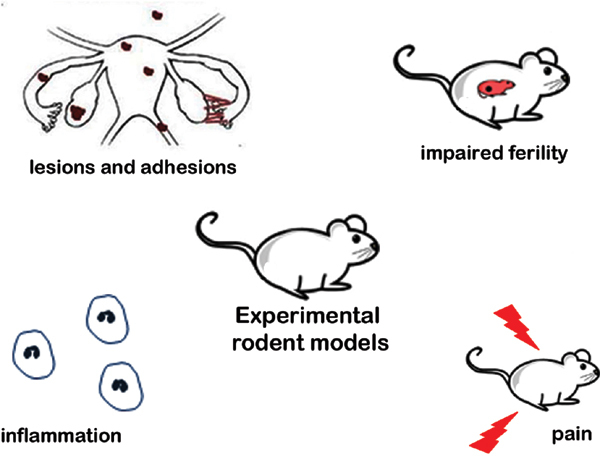 Results: Use of rodent models of endometriosis has provided a much broader understanding of the risk factors for the initial development of endometriosis, the cellular pathology of the disease and the identification of potential therapeutic targets. Conclusion: Although there are limitations with any animal model, the variety of experimental endometriosis models that have been developed has enabled investigation into numerous aspects of this disease. Thanks to these models, our understanding of the early processes of disease development, the role of steroid responsiveness, inflammatory processes and the peritoneal environment has been advanced. More recent models have begun to shed light on how epigenetic alterations contribute to the molecular basis of this disease as well as the multiple comorbidities which plague many patients. Continued developments of animal models which aid in unraveling the mechanisms of endometriosis development provide the best opportunity to identify therapeutic strategies to prevent or regress this enigmatic disease. Keywords: Endometriosis, inflammation, epigenetics, steroid action, co-morbidities, mice, rat. Keywords:Endometriosis, inflammation, epigenetics, steroid action, co-morbidities, mice, rat. Abstract:Background: Although it has been more than a century since endometriosis was initially described in the literature, understanding the etiology and natural history of the disease has been challenging. However, the broad utility of murine and rat models of experimental endometriosis has enabled the elucidation of a number of potentially targetable processes which may otherwise promote this disease.